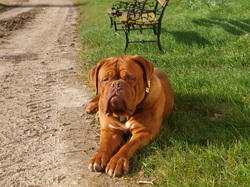 Dogue de Bordeaux & French Bulldogs - Heritage Morgans ......Our Heritage Is Your Future! Lions River Poetic Justice aka Ripley! She was a very unexpected addition to the family, but has become something very, very special to me! Wherever I am - you will find Ripley. Affectionately nicknamed 'The Beast of Blandford' the postmans face was a picture the first day they became 'friends'!!! We have also since become friends with Ripleys Breeders, Andy & Verity from Lions River Dogue de Bordeaux...and fingers and toes crossed there might be the tiny patter of paws in the near future!!!! ​I lost my beautiful Ripley in 2016 and was absolutely devastated. She was a very special girl and I miss her terribly. She was definitely 'My Girl'. My first experience of a Dogue, and she will always be a special one. Lionsriver Bazinga aka Bella, was a total surprise when we got her. We went to visit Andy & Verity and came home with another Ginger bundle!! She has turned out to be an absolute fantastic dog. Adores children and everyone who meets her. She was very lost when Ripley passed away, she almost had to grow up. She is still our big ginger puppy dog and every one loves her, slob included!!!!! ​Lionsriver Cartier aka Dora The Explorer! I need to stop visiting my friends as I usually come home with a new pup....and I did... again!!! I don't usually like little dogs, but this little girl has totally got me!! After losing Ripley, I didn't think I would have another dog that was 'mine'. She tried very hard to get under my skin, and now this little Bat Pig goes every where with me!! Dora has 'Small Person Syndrome', that's probably why we get on!!! She hangs off Bella's jowls. Bo is Mrs Doubtfire and keeps her in check. She is so naughty, has the biggest personality, and she is definitely my sidekick! ​I cannot recommend Andy & Verity enough for their knowledge in their breeding of quality Pedigree dogs. They offer a lifelong support for each and every one of their pups who leave them. Most importantly, they have become great friends! !